The whitebeam tree (sorbus aria 'Lutescens') is a native, British tree, found commonly in southern England. Its leaves are a spectacular colour in spring when they are a silver-white colour, the undersides being hairy. Attractive red berries in small clusters are appealing in autumn. 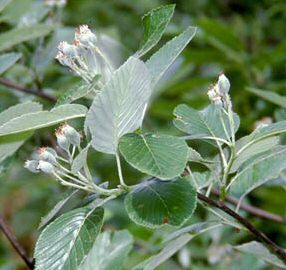 Whitebeam (sorbus aria) is in the same genus as mountain ash. An idea would be to include this with a selection of various mountain ash varieties and create a real splash of colour in autumn with their varied berry colours. There is much more information to be had on Whitebeam if you click the link above.